If libraries are to survive the recession and fend off proposed cuts then they need to become fortresses. 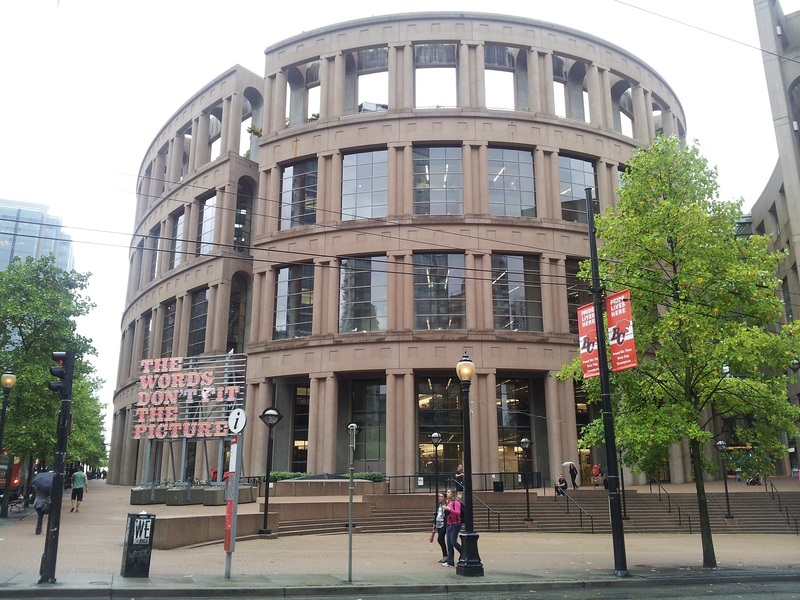 Vancouver Public Library is the personification of this ideal. It’s an outrageous, jaw-dropping monolith of knowledge that resembles the Amphitheatrum Flavium – the Colosseum in Rome. So beautiful and futuristic is this design that it has featured in The Imaginarium of Doctor Parnassus as well as being used for scenes in the television series Battlestar Galactica and its spin-off Caprica. If all libraries looked like this – a thing of beauty as well as immense power – the mere utterance that they should be closed down would be ridiculed. Nottingham, take note. 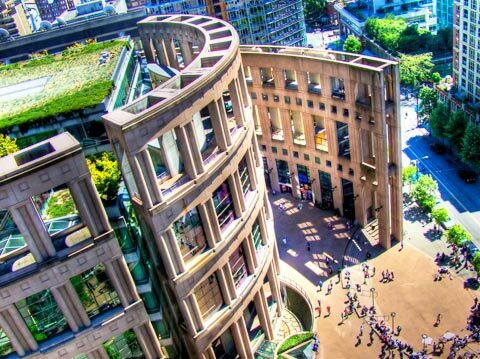 The Central Branch of Vancouver Public Library moved to its current location in Library Square, 350 West Georgia Street on 26 May 1995 at a cost of 106.8mil CAD. The Library Square links Central Library, a Federal Office Tower as well as retail facilities. The library is the centrepiece, spread over seven of the nine storeys and totalling 398,000 square feet, and is a functional rectangular shape that houses around 1.3 million books, periodicals and reference materials. The library is surrounded by a stunning free-standing elliptical, colonnaded wall that contains gorgeous reading nooks and study areas that are accessed by bridges spanning skylit lightwells. The library also has an internal glass facade that overlooks an enclosed concourse formed by a second elliptical wall that defines the east side of the site. This sends incredible streams of angled light throughout the structure, creating a magical liminal space. You’re not sure if you are inside or outside. The rooftop contains a garden designed by Cornelia Oberlander and is currently home to a family of Geese but there are plans to make the rooftop accessible to the public to create an incredible reading space overlooking the city. 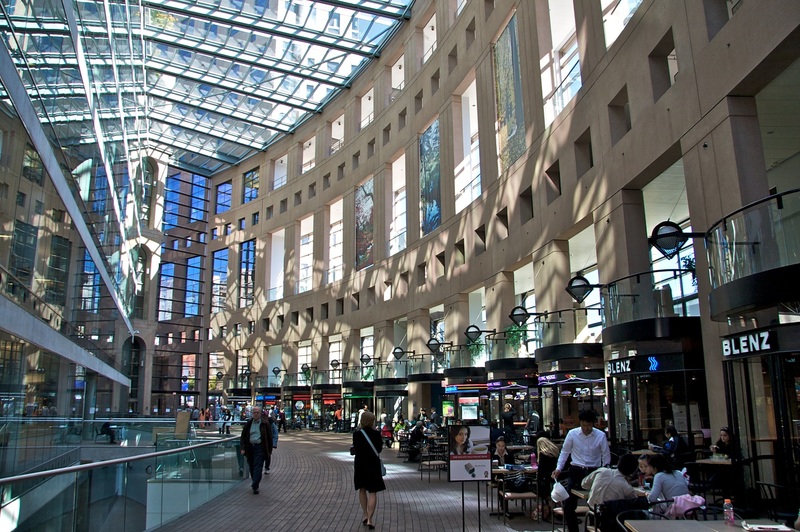 The Library Square Project was the largest capital project ever undertaken by the City of Vancouver and reinforces the importance of having visionary risk-takers at Board level when it comes to city planning. Locals were consulted via a referendum in November 1990 to ensure this wasn’t a grand design imposed on them. Indeed, it was the public we can thank for the radical design as they selected Moshe Safdie and DA Architects after a competition. The inclusion of the 21 story office tower in the design was required in order to pay for it and as part of a deal with the federal government to obtain the land. They say you shouldn’t judge a book by its cover but we do. Talk to anyone in publishing and they’ll tell you how vital a good cover image is for sales. The same aesthetic applies to libraries. Ugly relics from the sixties and seventies with their strip lighting and mustiness conjure depressing images and make them undesirable locations. Central Library in Nottingham has council offices inside so that you can pay your council tax, thereby conveying the image of queues and handing over money. It is a design born of function and convenience and desperately needs some je ne sais quoi. Readers must think I’m absolutely insane for wanting more money invested in Nottingham when we should be happy that our libraries haven’t been closed down. But after seeing what Vancouver has achieved – and closer to home, the Library of Birmingham – whatever budget Nottingham has it needs to be invested well. And if we can’t have an incredible architectural masterpiece there’s nothing stopping us using what we have at our disposal. There are many great artists in Nottingham as well as a lot of independent businesses and pop-up cafés who would be more than willing to help transform this tired space if given a chance. We may not be able to afford plastic surgery but there’s nothing wrong with applying a bit of slap.